Christmas is over and the new year is fast approaching! All that’s left is a few extra pounds and what’s left over from Christmas day and its build up. We’ve recognised that it’s this time of year where waste rises considerably more, so we’ve put together some ways for you to spend the post-Christmas period sustainably and guilt free. Re use your leftover gift wrapping for another present later on in the year. If your paper has been teared in awkward places or has rips, simply` trim them along the edges when it comes to re-wrapping and fold over the areas which may not look as neat. If you are left with a smaller piece than you originally had after first wrapping, use it for a future gift which is smaller, such as accessories or jewellery which don’t take up too much space. One of the best ways to sustainably gift your presents is to present them in gift bags. They can be used over and over again and don’t require any additional effort like folding and sticking. The same can apply to bows and foils which may have also been used to decorate your gift. If you wish to dedicate 2019 to the year of recycling to the max then be sure to try out giving gifts in gift bags from now on – not only does it look as fabulous as gift wrapping paper, but also encourages other people to pass them on and re use them too! Another reason to not throw away your leftover Christmas wrapping paper is to use them for crafts. Pretty patterned or coloured wrapping papers have many other uses. For example, say you have some pretty gold wrapping paper left over – use it to cut out stars which you could be used to decorate cards and more. You could even use your favourite patterned ones the following year and DIY your own baubles by placing it in a clear ball. However, if your wrapping paper is particularly christmassy (with snowmans or reindeers), there’s no harm in storing it neatly for next year to save you some cash – and it doesn’t take up much space! The time has come to take your Christmas tree down – it has done its job of embellishing your home all season, witnessed family coming together and the joy that comes with it. Along with the responsibility taken on when buying your tree, recycling it is also an important part of keeping sustainable over the Christmas period. If you have an artificial tree be sure to keep it for as long as possible as it’s made out of plastic PVC which is incredibly difficult to decompose. According to the Carbon Trust, “you would have to reuse your artificial tree for at least 10 Christmases to keep its environmental impact lower than that of a real tree”. In order to store it away for the following year, we would advise cleaning it branch by branch to remove accumulated dust before storing it in its box. When storing it, avoid places which are too wet to better preserve the tree and the colors of the branches. If you have a natural fir tree this is definitely the more ecological option in comparison. – If you have already bought and used a tree which has been cut at the root then it would have already dried out and can not be replanted. Make sure it does not end up in a landfill as they can take up a lot of space and the tree produces methane gas as it decomposes, an incredibly potent greenhouse gas. – The most ecological way to dispose of it would be to recycle it – this can be done in multiple ways. The most obvious would be to put it next to your recycling bin for it to be collected, however there are many local councils which have tree collection points to ensure that as many trees are recycled at possible. Make sure to check your local council’s website for more information. – You can also reduce your carbon footprint by turning your tree into wood chip for your outdoor areas or drying it out completely and using it as wood for your winter fires. The ideal way of loving the planet you live in is by growing your own tree. Buying a pot grown tree means that you’ll be able to re plant it’s roots in your garden for the following year. The only downside is that your tree must not be kept indoors for longer than 12 days as there is a risk of them dying. However, Fir trees are very resistant plants so once re planted their root systems will get back into action rapidly, allowing them to flourish again for the following year. They need very little attention over the year, just make sure to keep watering it well. Alternatively, should you not want to buy an actual tree, there are lots of ideas of how to make your own tree out of fun materials here. Although it’s certain that we love to eat our hearts out over the Christmas period, a lot of it still goes to waste. According to WRAP (Waste and Resources Action Programme), UK households throw away £15 billion worth of food over the entire year, generating tonnes of avoidable greenhouse emissions. With your leftover turkey (or chicken) carcass, boil it into a soup that will last you for weeks. Leftover fruit can be blended together into smoothies. If you have grapes with your cheese board, they can be frozen to go with drinks or by themselves – they taste like sorbet! If you use Stilton cheese it can also be frozen for future cooking. Cooked turkey can be blended for turkey mince or frozen for a later date. Whip any leftover cream and freeze it. Get inventive with leftover sauces, meats and herbs and turn them into whichever pies, curries and sandwiches take your fancy! If possible, give old toys a makeover. For example, should you have an old toy shop which has become worn and torn, revamp it with a lick of new paint or some extra nuts and bolts. It’ll soon be as if it was brand new! If you have a board game which has some pieces missing or even a pack of cards don’t have any aces… recycle them and get back that cupboard space. We hope you’ve picked out some useful top tips and inspiration, don’t forget to make sure to love the planet in the same way that you have shown love to your friends and family this holiday season! If you don’t have space for a Christmas tree, there’s no need to go without one this Christmas. Simply create a wall-mounted one instead! 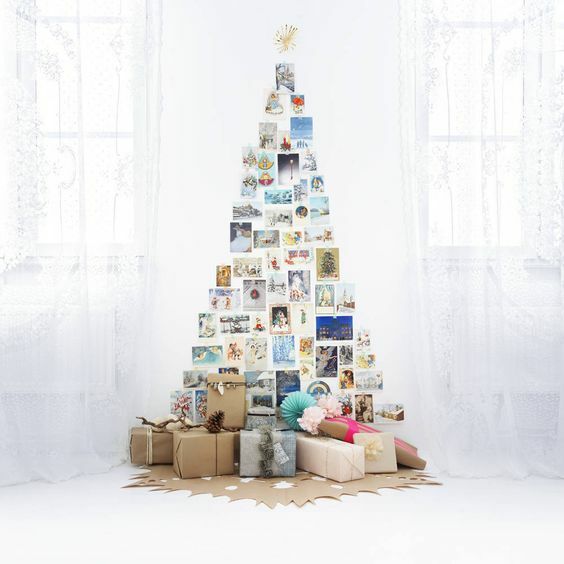 This wooden tree can be used as shelves to hold small gifts and decorations. Plus, the coat hooks on the base are the perfect place to hang your stockings! This version is painted in a distressed gold effect (read on to find out how this was achieved), but you could make it a traditional green tree, or pick a colour that works with your walls so that it can be used all year round. Cover the tree in tiny wire fairy lights and you’ve got a Christmas tree to be proud of. The measurements of the wood will depend on the size that you want your finished shelves to be. The measurements provided in this tutorial create a finished unit that measures 61cm wide x 82cm high x 9.5cm deep. The approximate cost of materials for this project is less than £50. You can access the shopping cart of some of the tools and materials used through this link. This project is suitable for people with some experience of DIY. This project should take about a day to complete. Allow time for drying, which will be determined by the recommended drying times on the spray paint or paint you use. If you require a second coat of paint, this will require more drying time and extend the length of your project. Use a palm sander to smooth off the rough edges of the timber where the cuts were made. Put the pieces into a ‘tree’ formation and mark where you would need to make holes to screw the pieces together. Use a drill with a countersink bit that matches the size of your screw heads to make holes where these marks are. Line up the pieces and use a fine drill bit to pilot drill through the first hole, into the piece you’re attaching it to. This will prevent the wood from splitting. Apply wood glue to the joining edges of the wood. Screw all the pieces together using countersink screws. Begin with the outer triangle, then add the shelves. Use wood filler to cover any screw-heads or gaps between joins. Allow to dry thoroughly before sanding smooth. Cover the whole unit with a couple of coats of chalk paint, allowing it to dry between layers. To create a distressed effect, begin by spray-painting the shelves gold. Let this layer dry thoroughly before painting on a coat of chalk paint. Once this top coat is dry, use wire wool or fine sandpaper to distress the edges so that the gold glints through the white paint. Alternatively, you can paint gold paint onto the edges, on top of the white paint. Drill pilot holes in the base section and screw in three coat hooks. Attach two brackets to the centre shelf and securely affix to the wall using wall-plugs and screws. And there you have a finished alternative Christmas tree! This article was written by Cassie Fairy. You can find Cassie’s blog ‘My Thrifty Life’ at Cassiefairy.com, where she shares daily blog posts about her home DIY projects, upcycled finds, budget recipes and plenty of inspiration for living a low-cost yet lovely life.